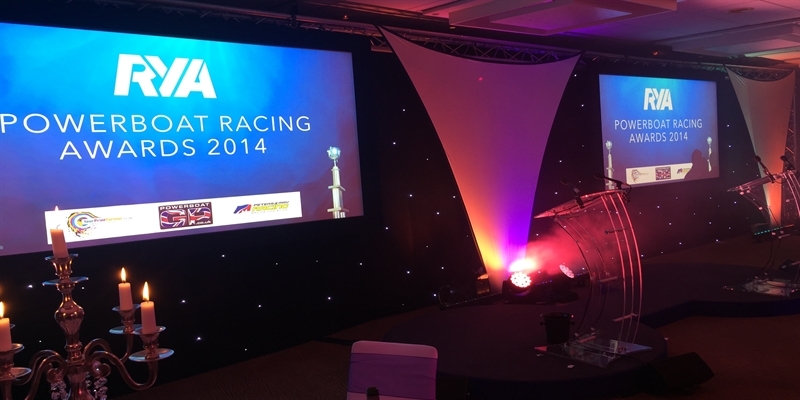 The Royal Yachting Association’s 2015 Powerboat Racing Awards saw the crème de la crème of the powerboat racing community come together to celebrate the successes of the 2014 season. The head of the RYA presented the awards ceremony along with special guest Tiff Nidel from 5th Gear. 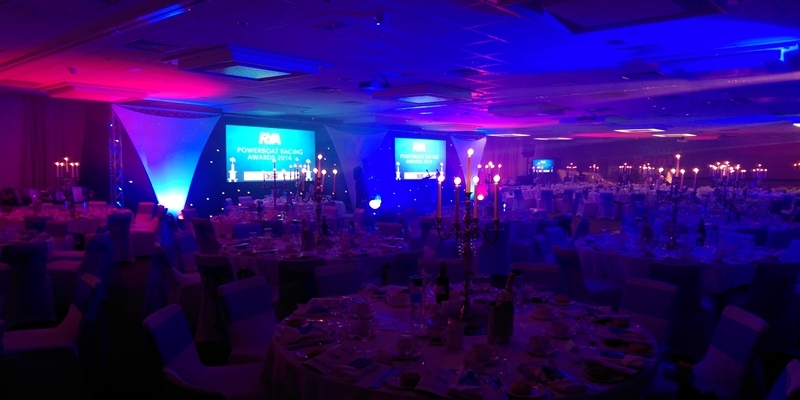 After having the same look for the last two years the organisers outlined their budget to Showcase AVi and asked our technical experts to come up with a different look and feel to the event. A stage was created using smaller circular stages and trimmed in branded colours – helping to make more of an impact than a flat rectangular or square stage. A backdrop made up of LED star cloth, with semi-transparent material applied to emulate a ship’s sail. Flown front projection trimmed screens. The lighting was a full LED set which included LED pixel lines, Robe moving heads and up-lighters. 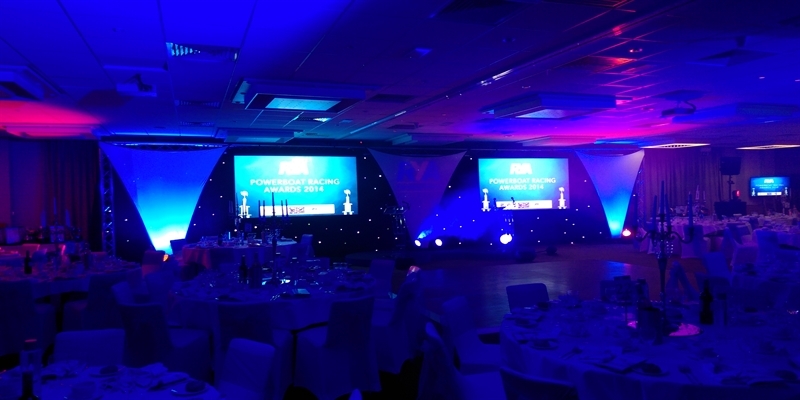 The technical set equipment was hung from a ground stacked truss system, designed by us to fit the room layout. Mac moving heads displayed all of the sponsors logos, onto the back wall, in full colour. 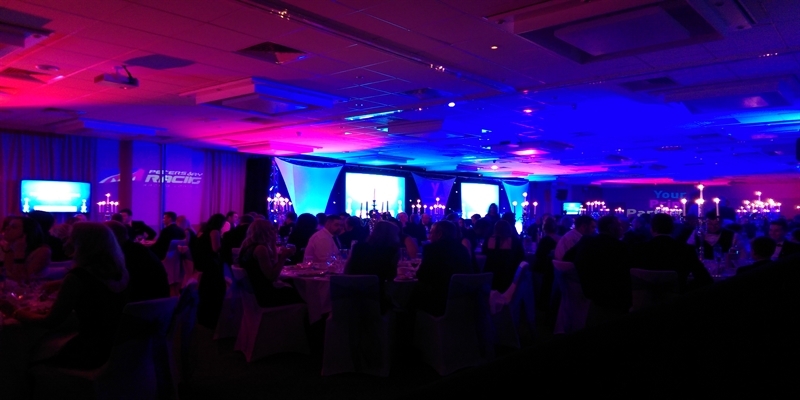 The system was completely DMX controlled and programmed along with haze to provide additional effect. Full D&B T-series line array with additional front fills to the stage. Presentation UHF music systems for the event along with music background facility for the DJ. Barco switching system for playback and awards ceremony running through the Panasonic 10k lumens projectors. The client had a tight budget to work to, we therefore worked the product specification around the budget. By using similar equipment to previous years but using the technology in a different way we were able to give a different look and feel to the event. 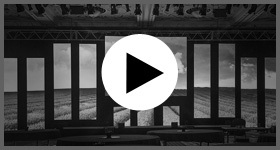 We developed a timed production schedule and our production crew were on site to run through rehearsals prior to event go live.